With clear sunny skies and the wind back to the prevailing south-south-west the 2018 Fly! 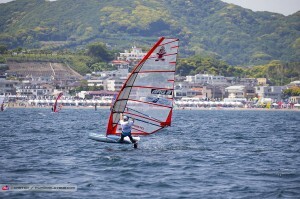 ANA Yokosuka PWA World Cup finished on a high as a further two foil eliminations were completed in 6-15 knots on the final day. With the wind remaining too light for slalom, the opening foil race of the day started shortly before 11:30am and the pressure was on Gonzalo Costa Hoevel (Starboard / Severne / Chopper Fins), who led the event rankings heading into the final day after the first two races as any mistake could potentially cost him the event. In the final, the Argentine went rail-to-rail with Amado Vrieswijk (JP / Severne) as the two of them pulled well clear of the rest of the fleet, but Costa Hoevel gained the upper hand as they rounded the downwind mark after setting a slightly better lay line, which allowed him to accelerate into the lead and soon claim his second victory in 3 races to take a stranglehold over the event. Meanwhile, Vrieswijk finished a close second followed by Sebastian Kördel (Starboard / GA Sails) and Antoine Questel (Starboard / S2Maui), who both recorded their best results of the week in 3rd and 4th respectively. Before the start of the next foil race it was confirmed that Elimination 4 would be the last foil elimination of the event – meaning that Gonzalo Costa Hoevel would be the champion of the first official foil event on the PWA World Tour no matter his result – as with a discard coming into play in Elimination 4 it was impossible for anyone else to catch the Argentine. With the championship sewn up Costa Hoevel continued his rich vein of form as he again shot into contention after the opening leg, but at this point, Maciek Rutkowski (I-99 / Challenger Sails) held the lead. However, as the Pole raced along the downwind leg his nose touched the water, allowing Costa Hoevel to close the gap and they were soon neck and neck. Both men then chose to tack at virtually the same time before heading to the upwind, and this is where Rutkowski gained the upper hand again as Costa Hoevel got a piece of seaweed caught around his foil, which brought him to a standstill, while Rutkowski did brilliantly to make it around the upwind mark, when it looked like it may be impossible. This sent the 26-year-old into a clear lead and the Pole would soon be celebrating his first race win on the tour. Meanwhile, Antoine Albeau (RRD / NeilPryde) fought back to finish second in the race and in the overall rankings, while Sebastian Kördel clinched the final place on the podium after Julien Bontemps (JP / NeilPryde) endured a final day meltdown, which saw him finish 11th and 12th in both races completed today, having finished 2nd and 3rd in the opening two races to eventually finish 4th. With no more racing for either the men’s or women’s slalom fleets that means that Antoine Albeau (RRD / NeilPryde) and Delphine Cousin Questel (Starboard / S2Maui) walk away from the opening event of the year with the first victories of the season, while Matteo Iachino (Starboard / Severne / Shamal Sunglasses) and Pierre Mortefon (Fanatic / NorthSails / Chopper Fins) complete the men’s top 3. 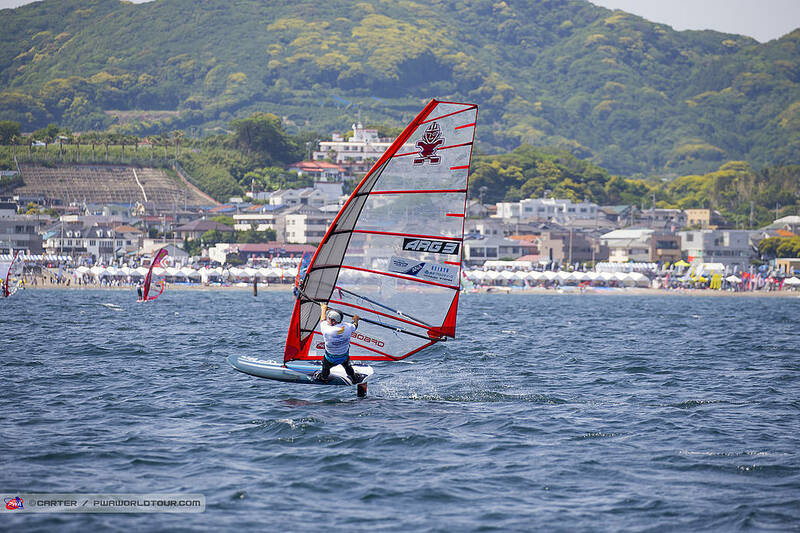 Meanwhile, Lena Erdil (Starboard / Point-7 / AL360 / Chopper Fins) and Marion Mortefon (Fanatic / NorthSails) complete the women’s podium and we’ll take a full look at the results from Japan in the event summary. We’ll be back in just a few days when the PWA Slalom World Tour resumes in South Korea after a short plane journey as the men and women prepare to compete at the Ulsan PWA World Cup, which runs between the 19th-24th May.